Banana que is actually made mainly of cardava banana or saba in the Filipino language, a kind of tropical banana that grows in large amounts in the Philippines and many tropical Asian countries. Saging na Saba trees are common in the backyards of Filipino homes especially in provinces. It is called such because like the Filipino Barbeque, it is on a bamboo skewer. 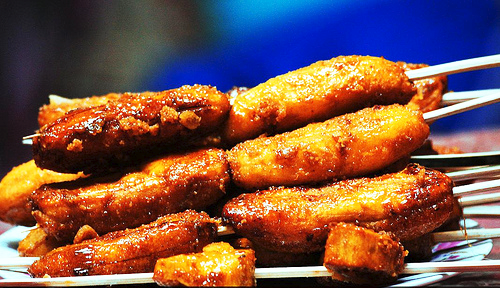 Because bananas are not complicated to prepare into a snack, Filipinos make banana cue every day, usually in the afternoons when people want to grab a mid-day snack or merienda. 1. In a large wok at high flame heat cooking oil, when it is smoking hot, drop the bananas and fry for about 2 minutes or until they start to slightly brown. 2. Sprinkle the brown sugar and let it stand without stirring. When the sugar starts to caramelize, start stirring the bananas to have it coated with caramelized sugar. 3. Continue frying, stirring several times to have the bananas fully coated with caramelized sugar. Turn the heat off once the bananas are cook through, do not overcook. 4. Drain in Fry Skimmer Strainer or colander or deep bowl with paper towel to remove excess oil. 5. Skewer two bananas in a bamboo stick while they slightly cool down. Do the same for the rest of the bananas.Serve.